On Friday I was fortunate enough to engage in some very interesting math PD and was introduced to the idea of three act math videos! These interactive videos engage children in a rich, real life situation that is highly interesting. 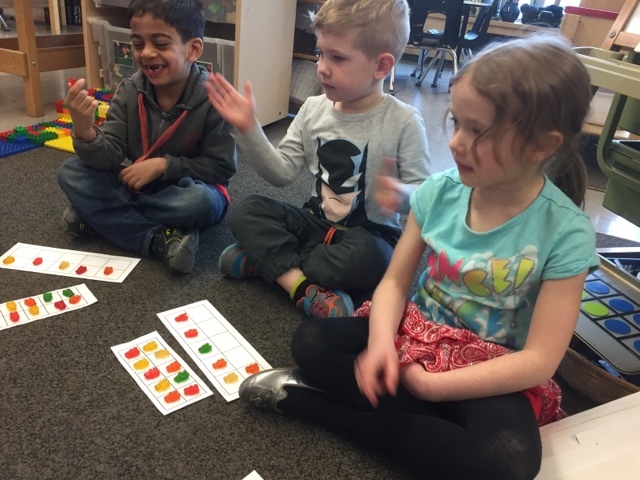 I wanted to replicate this idea with my kindergarten students but had difficulty accessing a developmentally appropriate math problem. I decided to create my own. 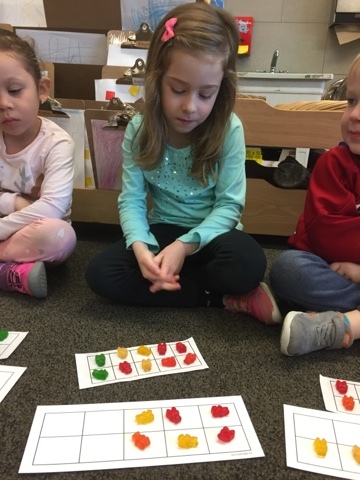 I told the children that on the weekend Sobey's had a sale on gummy bears and I bought a big pack, but the problem was I didn't know how we were going to share all the gummies in the class. I asked them what we should do. 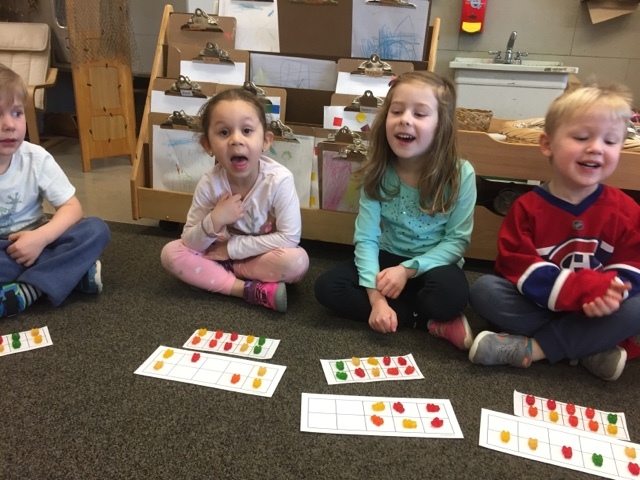 One child immediately suggested that in order to accurately count the gummies, we should use a tool like a hundreds grid. 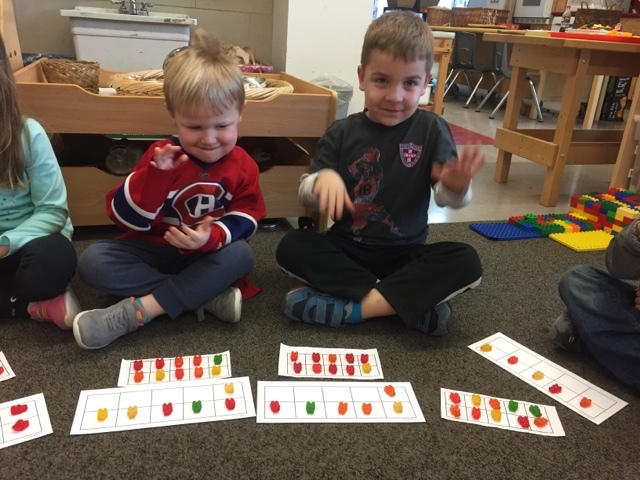 He knew the gummies were way too many to count quickly and figured that it would be a big number. 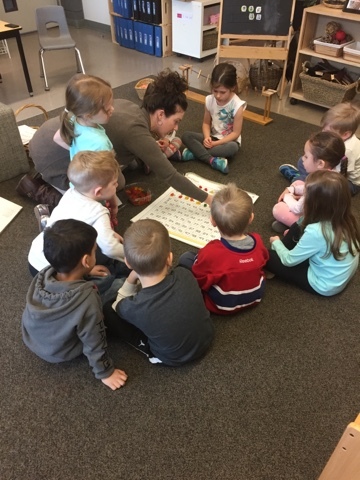 We covered our hundreds grid with plastic wrap (so it was a clean surface) and began to count them out. 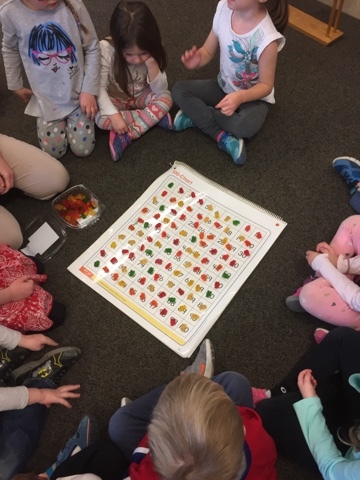 Once we reached 100 gummies on the grid, the children suggested that we remove them into a pile (because we already knew there were 100). We then started the process again. 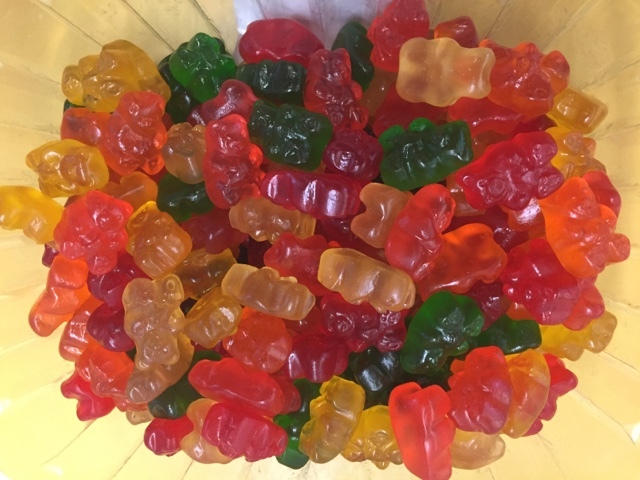 Altogether there were 179 gummies! 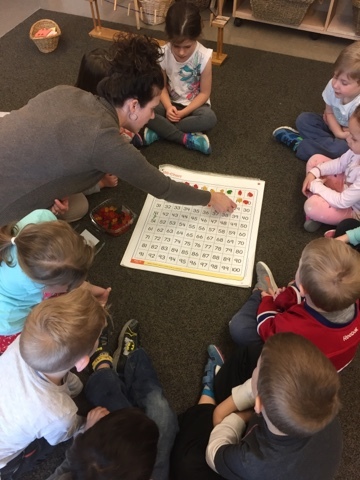 The children knew this was a big number and predicted that they each would get a big handful! I told them I wasn't sure how we were going to fairly share 179 gummies and asked them what to do. 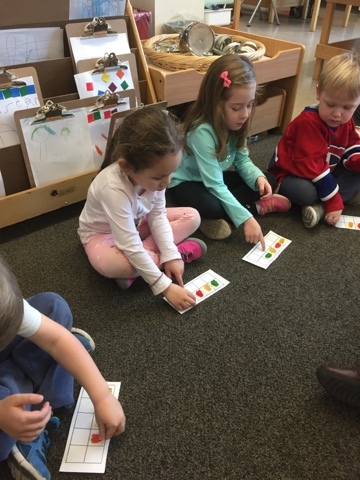 A number of children immediately suggested that we use ten frames to make sure that each child gets a fair number of gummies. I asked them to clarify "fair" and they explained that fair meant "equal". 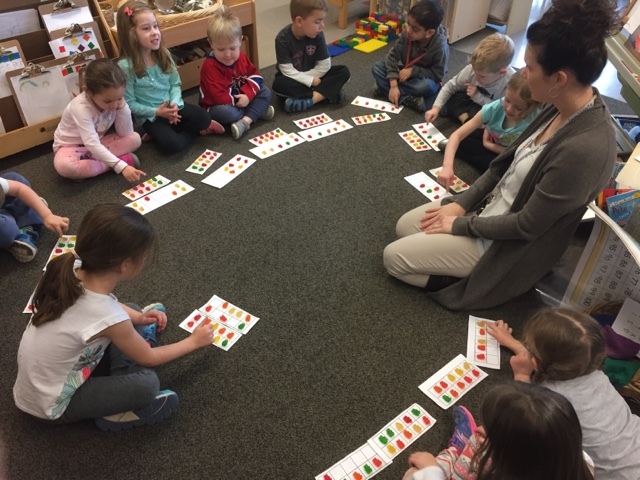 We sat in a circle and each child had a ten frame. 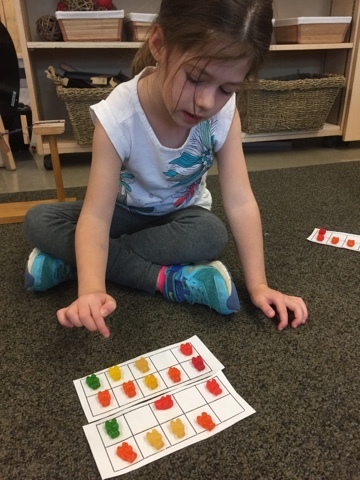 I passed the gummies out one by one and the children carefully placed them on their ten frame. 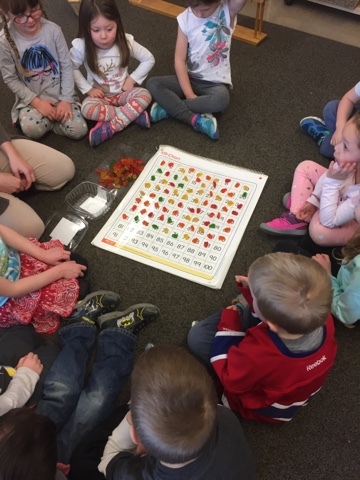 Another problem quickly arose...the ten frames became full and we had more gummies to pass out. "We need another ten frame each!" 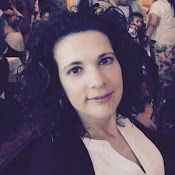 one child shared. Finally the gummies were passed out. 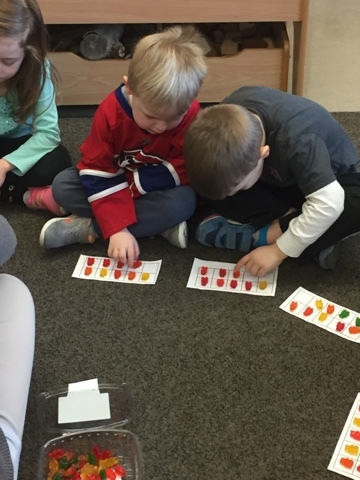 Each child received 16 gummies with a remainder of 3. 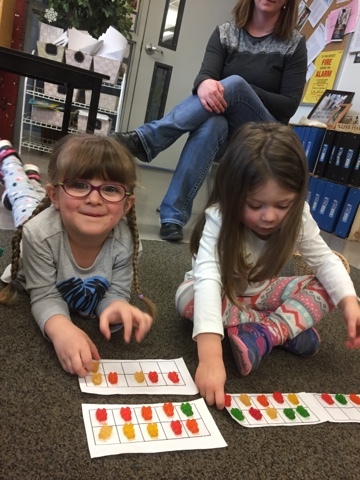 The children knew it would be difficult to split the remaining 3 gummies so we kept those aside. Wow! I was incredibly impressed! 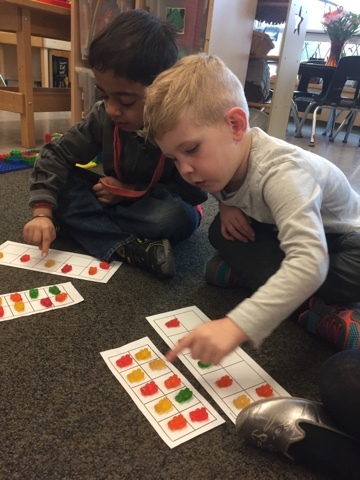 Not only were the children able to quickly suggest a tool for helping us to calculate the large number of gummies altogether, they knew how to use math tools to help them fairly divide the gummies so that each child had the same amount. This complex, multi-step problem was a breeze for this math experts!